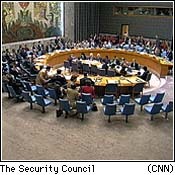 UNITED NATIONS (CNN) -- Both sides emerged as resolved as ever after the U.N. Security Council's decision Wednesday to condemn Iraq and impose a travel ban on its officials. While U.S. officials hailed the unanimous (15-0) vote, Iraq announced that it would neither back down nor rescind its order expelling American weapons inspectors. "Iraq will continue to explain its just case," Iraqi Deputy Prime Minister Tariq Aziz said in a statement issued after the Security Council vote, "and this resolution will not scare it." 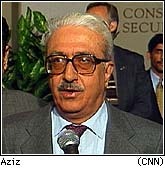 Aziz also reaffirmed his country's determination to expel American weapons inspectors and to shoot at American-manned U-2 planes on U.N. surveillance flights. U.S. Ambassador to the U.N. Bill Richardson: "...The message is clear: Iraq must comply or face consequences." U.S. officials responded with some belligerence of their own. "It is not for Iraq to set the terms of its compliance," said Bill Richardson, U.S. ambassador to the U.N. "Iraq must simply comply. And as this resolution demonstrates, there will be consequences for Iraq if it fails to do so." "Any sign that they are not ready to comply will be read for what it is...an act of defiance and an act that requires further measures," said White House spokesman Mike McCurry. Earlier in the day, Iraqi officials again barred Americans on U.N. weapons inspection teams from entering Iraqi sites for the ninth time in 10 days. As has become the pattern, the teams then left the sites rather than enter without the American members. Condemns Iraq for its October 29 order expelling the Americans and demands it be rescinded immediately and unconditionally. Imposes a foreign travel ban on Iraqi officials who interfere with U.N. inspections and suspends Security Council reviews of economic sanctions against Iraq until Baghdad cooperates with the inspectors. Warns of "further measures" if Iraq refuses to comply with the resolution and those that preceded it. It does not, however, specify the use of military force, an option opposed by Russia, France, China and other members of the council. Although the military option is favored by the Americans and British, they did not push for a warning of "serious consequences" in the measure, and in return got a unanimous vote. Russia's ambassador Sergei Lavrov said, "We are convinced that any complication with Iraq be resolved exclusively by political means. Any other approaches, particularly actions involving force or future use of force, could ... take us all a long way back from the goal ... of eliminating the threat to peace and security in that region." Russian Ambassador to the U.N. Sergei Lavrov: "...the military action is not going to be supported by the Security Council." Richardson said last-minute diplomatic efforts to reach an agreement were snubbed by Iraq, whose foreign minister, Mohammed Saeed al-Sahhaf made "a very negative statement" at a news conference in Baghdad earlier Wednesday. Anticipating that the Security Council would adopt the resolution, Sahhaf said that Iraq would retaliate by giving Americans working with U.N. inspection teams one week to leave the country. He also said that Iraq would shoot down U.N. aircraft. "It is not a matter of to shoot daily," he said. "It depends on developments, but whenever we see proper to shoot them, we will shoot them." Al-Sahhaf accused the United States of "blackmailing" other council members and predicted that unity on the 15-member council "will be very temporary." The primary effect of the resolution is to restrict the travel of certain Iraqi officials who have prevented the inspectors from entering Iraqi weapons sites. Although the travel ban will be difficult to implement, the mere threat of preventing trips abroad by Iraqi civilian, police and military officials -- except for diplomatic purposes -- was the catalyst for the current crisis. Bill Richardson, U.S. Ambassador to the U.N.
Stephen Gomersall, Deputy British Ambassador to the U.N. 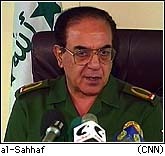 Some Arab diplomats say that identifying by name the officials responsible for blocking the inspectors is regarded as insulting by Iraqi leaders and as an attack on Saddam Hussein's government. Iraq must prove to the inspectors that it has no more weapons of mass destruction before the U.N. will lift trade sanctions against it. 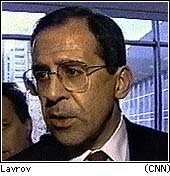 The sanctions were imposed in August 1990, after Iraq invaded Kuwait and touched off the Gulf War. Egypt's ambassador, Nabil Elaraby, emphasized that the travel ban must not obstruct his country's role as host of the Arab League. He also said that Egypt "understands the feelings of despair and frustration felt by the laymen in Iraq" after more than seven years of economic sanctions. French Ambassador Alain Dejammet, too, stressed the impact of sanctions on the Iraqi people. Despite an oil-for-food plan allowing limited quantities of goods to be bought, Dejammet said the average Iraqi's calorie intake has dropped by one-third. He said that infant mortality has increased 124 percent and life expectancy has decreased from 65 to 57 years. Dejammet also warned the council against steps that might prompt Iraq to close the entire U.N. surveillance mission, which is there to make sure Iraq does not re-arm. "The security of the region is at stake here," he said after the vote.